At Revelle College, we focus on you and are proud of your successes here and after graduation. Through the rigor of academic curriculum, community engagement, and collaborative experiences and activities, Revelle's general education program seeks to achieve critical thinking, confidence, engagement with big questions, and intellectual community. Revelle College welcomes you! Current students, faculty, founding faculty, alumni, and staff share their experiences here, and, read more in Revelle Foundations, a transcript of interviews about Revelle and it's curriculum history. Please join us in congratulating Dr. Antony Lyon, Assistant Director, Revelle College Humanities Writing Program, for winning the prestigious 2018-19 Saltman Distinguished Teaching Award. Antony’s stellar teaching and commitment to students is well-known within Revelle College, and it is wonderful to now see his efforts acknowledged campus-wide. The Northeast region, including the Canadian provinces of Ontario and Quebec, New York and New England, aims at drastically cut its greenhouse gas (GHG) emissions by 2050, with significant reductions planned for 2030. The power sector will be at the core of this energy transition, as it will have to be both further decarbonized and used more extensively, due to the electrification of heating, transportation and industrial processes. While the energy policy and power system literatures largely acknowledge the benefits of regional collaboration and integration, the Northeastern power markets are operating in very different market designs and no regional planning exist. We developed a capacity expansion model to assess the benefits of greater institutional (shared capacity) and physical (additional interconnections) integration in the Northeast, under GHG reduction goals varying from 50% to 100%. The exceptional availability of Canadian hydropower with reservoir in this region is modelled, to illustrate how it can ease the addition of variable renewable energy. SULI encourages undergraduate students and recent graduates to pursue science, technology, engineering, and mathematics (STEM) careers by providing research experiences at the Department of Energy (DOE) laboratories. Selected students participate as interns appointed at one of 17 participating DOE laboratories/facilities. They perform research, under the guidance of laboratory staff scientists or engineers, on projects supporting the DOE mission. "I was quite excited to start Hum[anities] when I first came to Revelle, it was one of the reasons I put Revelle as my first choice college at UC San Diego, even though that was quite uncommon as an engineering major. I wanted to have a well-rounded education, and to me, taking classes on history, philosophy, and literature was an essential addition to my engineering training. Taking this sequence has taught me to consider and value perspectives that are not my own, and it taught me how to construct well thought-out, evidence-based arguments which have been essential in my career. Not only that, but I read works of literature I probably never would have on my own and, as a self-proclaimed bibliophile, will always treasure that, especially now that time for reading is hard to come by. The Revelle Humanities sequence is a lot of work, but it’s absolutely worth it. It is what will set you apart from many other undergrads at UCSD, and it will also open your mind in ways you never would have expected. Furthermore, the Revelle Hum professors have been some of the best and most engaging professors I have had the pleasure to learn from. They care so much about their students learning and always bring a fascinating perspective. If nothing else, I would suggest taking Hum as an opportunity to get to know these professors, as they would be wonderful mentors to help guide you throughout your time at UC San Diego and beyond. "Starting this sequence strong in Math and engineering focus, and not strong in reading, I was quite intimidated. You immediately met sophomores who were dying to tell you how hard it was. All that said, I am so happy it was part the curriculum. I would have never read so many interesting pieces of literature. I saved all my humanities books and still pull some out today. As far as my career and life, it taught me to get out of my comfort zone more and that is really where you learn new things. In addition, it simply gave me stories, weather about the classes, professors, novels, etc. that I could share and use in some of my day to day work and conversation as a manger or with customers. Humanities is chance to stretch and branch. College is not just a time to get that major – it’s a time to try new things. Learn more. Some way want to pursue it at a major or minor which is wonderful. For most, it is an experience. To this day, all my friends and I probably talk about the humanities series more than anything other class. We all had to do it. From Professors, to TAs, to papers, to books to grades. Find Revelle College using this Google Map! Get driving and walking directions and view parking nearby. Click the map to type building names into the search field for clear directions. UCUES - Tell Us More! Share your voice! 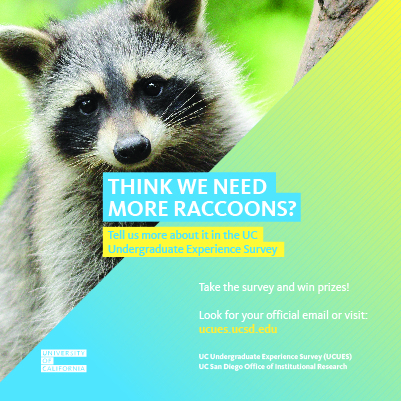 Tell us about life at UC San Diego and win prizes! Nominations are currently being accepted for the Revelle College student leadership awards, which will be presented at the 41st Annual Student Leadership Recognition Ceremony. The ceremony provides an opportunity to highlight Revelle student leaders and organizations for academic performance, leadership, and overall contribution(s) to the Revelle College community. DEADLINE to Submit: Wednesday, April 17, 2019, - 4:00pm. SUBMIT your nomination by clicking on the title. QUESTIONS? Contact Revelle Dean of Students Office at 858-534-3493 or redean@ucsd.edu. Want to speak to thousands from stage on June 16 at your Commencement Ceremony? Click the title and APPLY NOW to be the Revelle College Student Commencement Speaker! Your voice is needed! Click the title to APPLY NOW to sing the National Anthem at the Revelle College Commencement Ceremony! Are you interested in joining RCC, your student governing body for Revelle College? Transfer Representative and Student Fee Advisory Campus-wide Representative positions now available! Click the title above to Apply NOW! If you are preparing to graduate in June 2019, click the title for important information. Deadline for commencement program: May 1, 2019, 11:59pm. REV'd! Talk with Provost Antonovics, Every Monday! Revelle Faculty and Students! REV'd moves to Monday afternoons at 3-4pm in winter quarter - Join Provost Antonovics for tea, cookies, and fresh fruit - and great conversation! Where? Revelle Admin Building, Conference Room East. Join Provost Antonovics, Revelle Faculty, and fellow students for Revelle Monday on May 6 - 10:00 - 11:00 am, in Revelle Conference Room C (just behind Roger's Marketplace). Free continental breakfast! Great conversation! Mark your calendars! 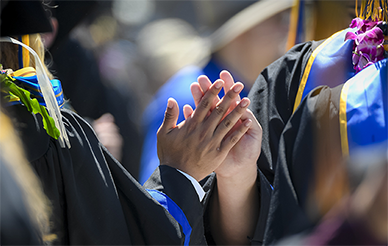 Revelle College Commencement will take place on Sunday, June 16, 2019, at 11:30 am on RIMAC Field, UC San Diego. Click the title for more information. Revelle Events Publicity Form, your link to Revellians! Revelle College provides Revelle students and staff with weekly updates on upcoming college and campus events, programs, and opportunities through our newsletter, InfoLink as well as through RA newsletters to the Revelle residential community, and through Revelle social media. Click on the title to get started! Revelle College Council (RCC) is pleased to offer new student services, including the Revelle College Rental Program! Borrow board games and chairs for 24 hours in exchange for your PID and contact information at the College Center desk at the bottom of Blake Hall. If you’d like to offer any comments or suggestions, please contact the Revelle College Council Director of Student Services at rccdss@ucsd.edu. Revelle College, founded in 1964 and named for UC San Diego founder Roger Revelle, emphasizes a solid background in the liberal arts and sciences as the foundation for a contemporary education.